Washington, NC Bojangles'® Tands, INC. Store #9 - Bojangles'® / Tands, Inc.
Bojangles’® is a Washington, NC favorite, and it’s no secret why! Bojangles’® famous Cajun-style fried chicken, made-from-scratch biscuits and flavorful side dishes like Dirty Rice® and slaw are just the delicious southern-style food Washington, NC craves. Swing by Bojangles’ on Carolina Ave in Washington, NC for fast, friendly service all day—breakfast, lunch or dinner. 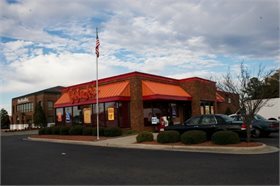 The Washington, NC Bojangles’® is located on Hwy 17 near Wal-Mart, Carmike Cinema & Pamlico Plaza. Grab lunch at Bojangles’® and take advantage of the shopping and entertainment in downtown Washington, NC! Bojangles’® always looks forward to the annual Washington, NC Summer Festival. We love being a part of the great community in Washington, NC and providing a place for families and friends to get together and enjoy some good food in good company.